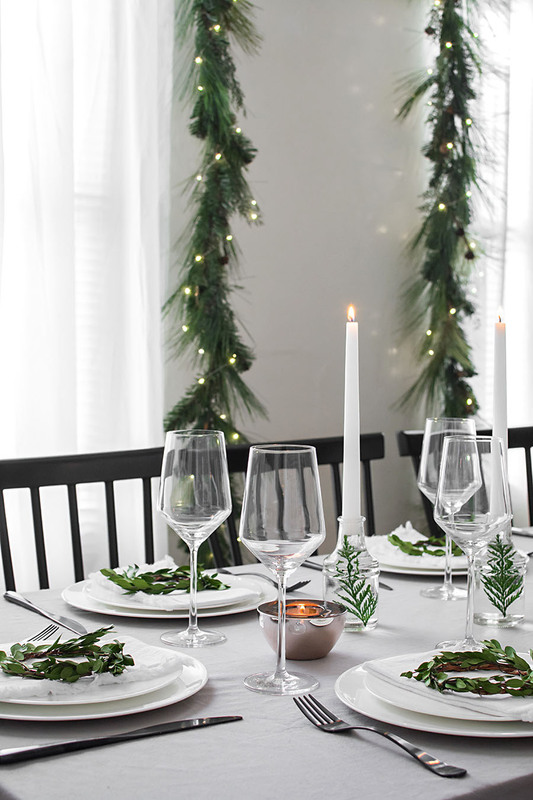 Ahh, my favorite occasion to set the table for. 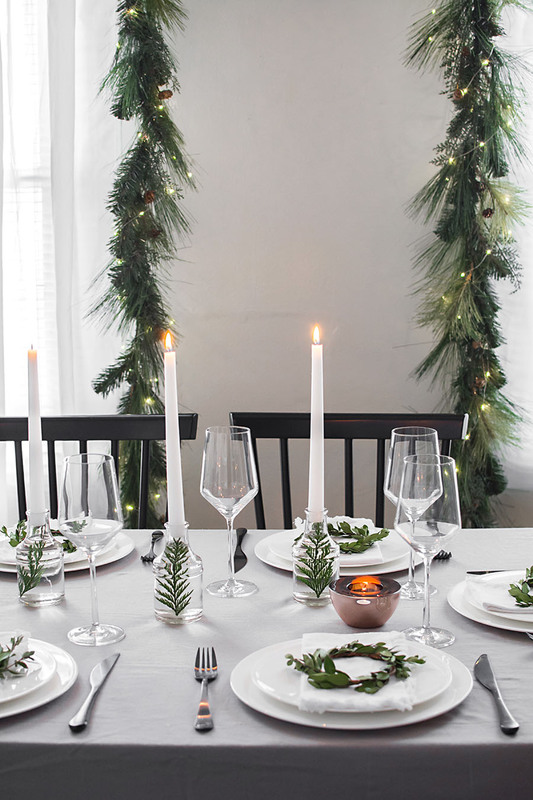 While I consistently keep my table settings simple, the holiday season naturally invokes a whimsy that’s only possible this time of year. It feels most magical, which is why I love it so much! Inspired by the shorter days of the season, I’m going with a moodier table that accompanies the darkness of winter. 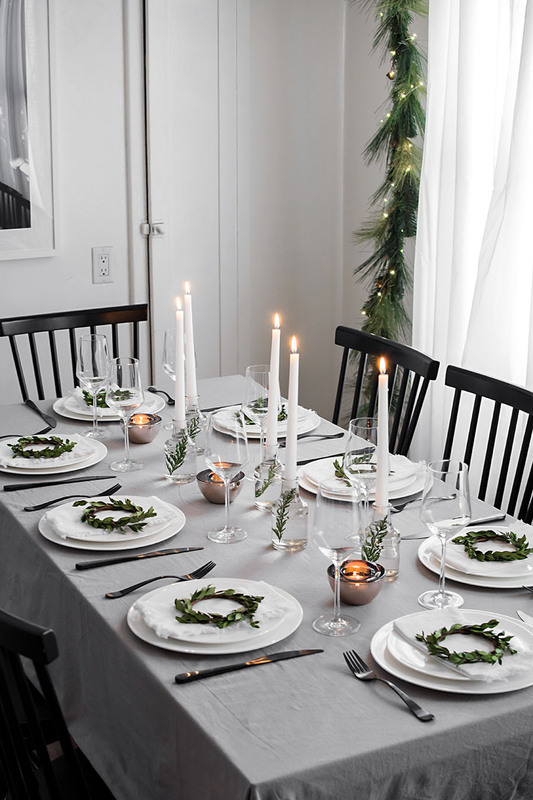 In partnership with Bed Bath & Beyond, a favorite of mine for being a one-stop-shop for everything I need to entertain in style, read on for how I put this holiday table setting together. My plans for this table started with this gray relaxed cotton tablecloth. I love that it has an organic texture similar to linen without the high price tag typically associated with linen. 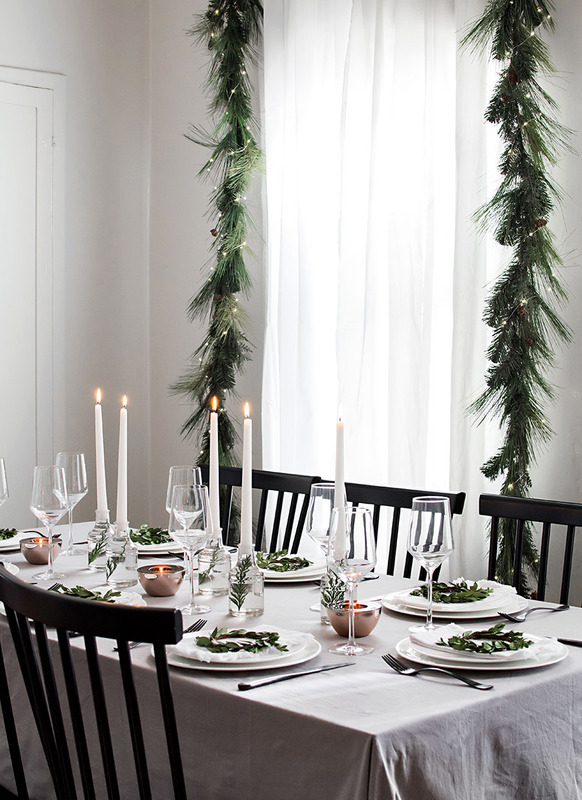 It’s soft and makes the entire table feel cozier on its own. The color is also the perfect darker backdrop for the rest of the tabletop items to stand out against it. The white dinner and salad plates were exactly what I was looking for in terms of being equally simple and modern so that they work for both casual and special occasions. Living in a small space, it’s most preferred that everything we bring into our home can serve multiple purposes, so I’m always looking out for that especially with our tableware. These are chic without feeling like they need to stay preserved inside of a cabinet the other 364 days of the year. They work for everything and will never go out of style. The silverware is where I like to dress it up for a special occasion. The dark gun metal color and shine of these forks and knives make the whole table feel more luxe. I also pay attention to how comfortable silverware is to hold, and the streamlined shape and significant but not heavy weight make these feel really good in your hands. It does a lot to make an occasion feel more special. 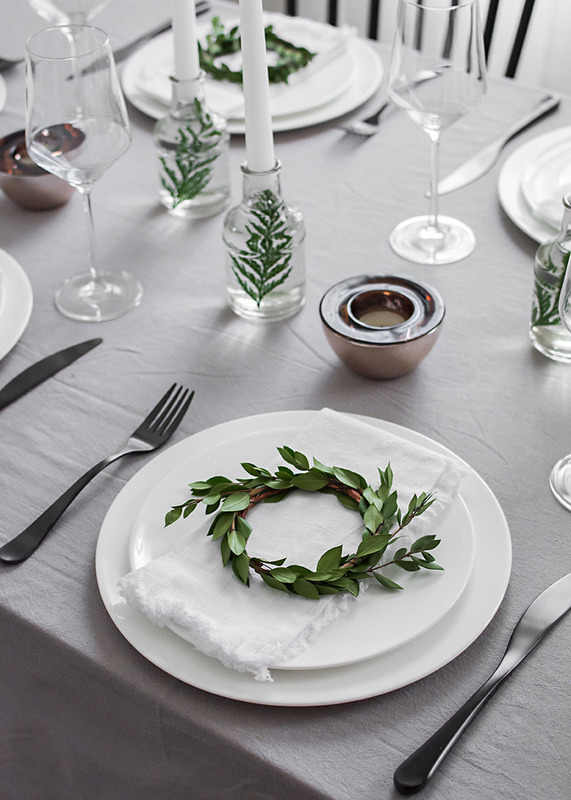 For each place setting, I made these mini wreaths out of floral wire and stems of myrtle. Putting some sort of detail like this at each setting will always make guests feel special. 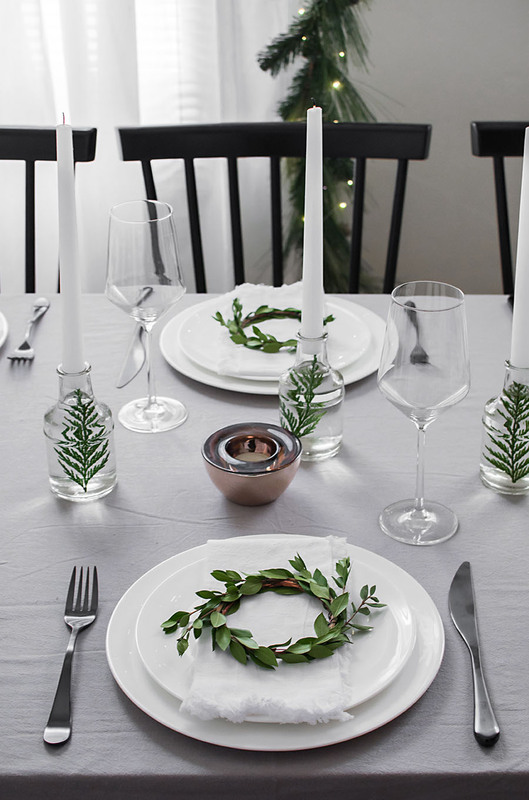 It’s simply fun and dresses up the table at the same time. 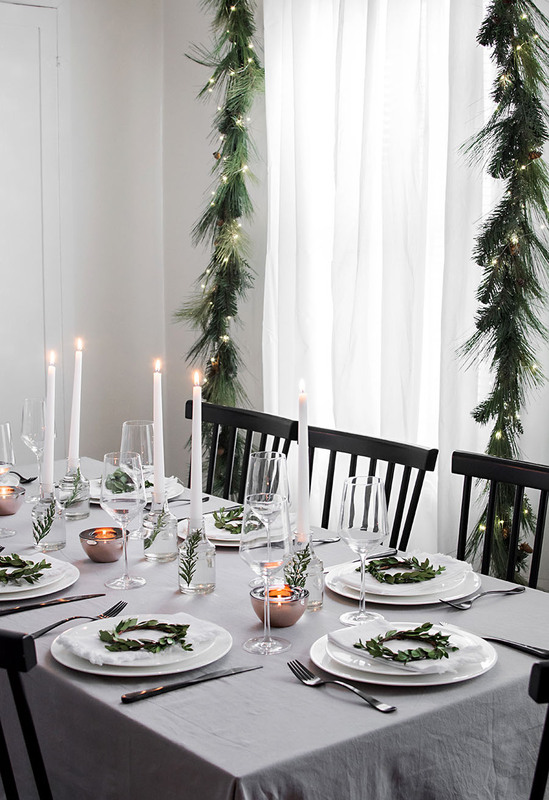 I have each mini wreath resting on top of white relaxed cotton napkins, and I love the fringed edges for adding warmth and feeling inviting. The wine glasses are another item I consider perfect for both casual and formal occasions. The unique modern shape feels elevated for special occasions but is still simple for the everyday too. I’m also really partial to Schott Zwiesel glassware ever since I went to an event where the host banged the glass a few times against the table and demonstrated that it didn’t break. The crystal is impressively durable and I’ve been loyal to it since! This next detail is probably my favorite part of the table. 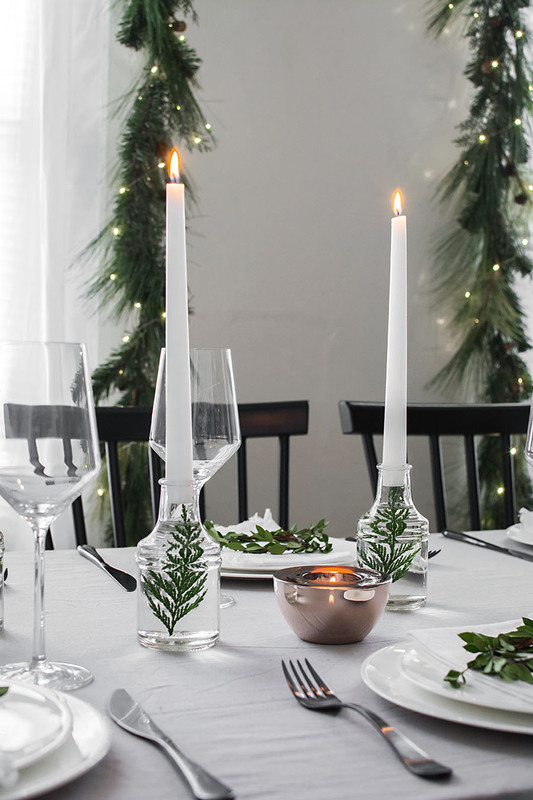 I repurposed these mini glass vases into taper candle holders, filling each vase with water and a cedar leaf and capping each one off with a tapered candle. The water keeps the cedar leaf from drying out and magnifies it through the glass, which looks just plain beautiful. 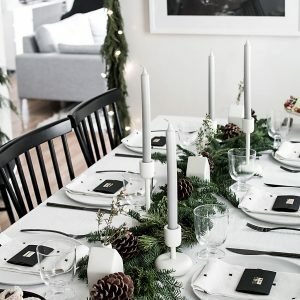 It’s a unique alternative to traditional candle holders that eliminates the need to add florals or foliage to the table so long as we’re keeping things simple. I also added in copper votive holders that ended up being even more gorgeous in person than I had already expected. It adds just the right amount of shine in a copper color that’s rich but not loud. Once lit with a candle inside, it glows and shines even more. I inserted these tea light candles that smell like delicious Christmas sugar cookies and they’re the perfect finishing touch. In case you missed any sources in the post, I’ve linked everything below and it’s all from Bed Bath & Beyond. It’s always helpful to be able to source everything from one place knowing I’ll come across unique finds that fit my style. They truly have something for everyone and everything for entertaining on their site. I normally prefer to shop online, but when I need something quick I’ll order it online to pick up in-store. It’s incredibly convenient to have my order ready and waiting vs. roaming the store myself, which is especially needed amidst all the other things we need to get done this crazy time of the year! This post is sponsored by Bed Bath & Beyond. Thank you for supporting partners that help HOM create and share original content. Love it! 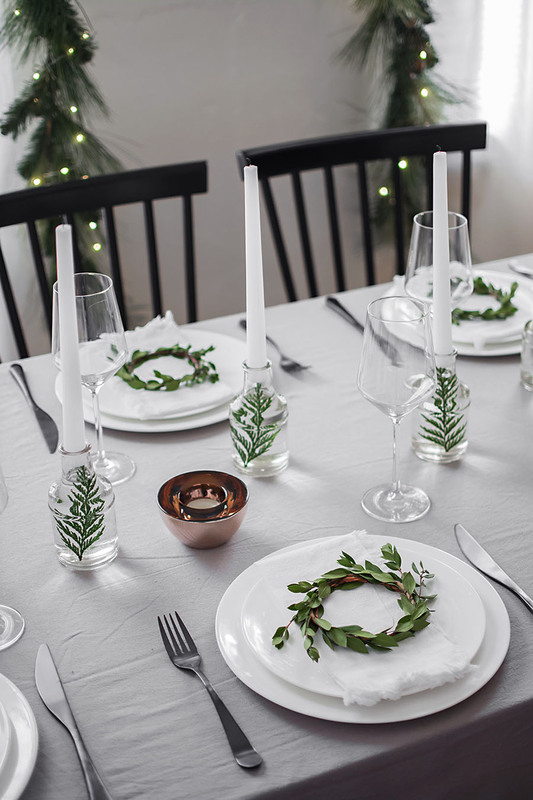 Could you do a post—either blog or Instagram—on making the wreaths? 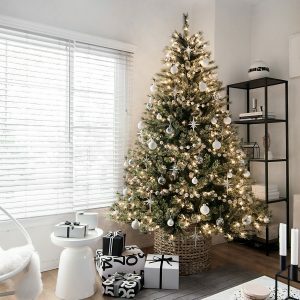 Might be easy but would like your how-to! I actually do have a post on how I made them! You can check that out here. Wow, everything is so pretty! I love the simple pattern of white, green, and softer yellows. The whole setting is very aesthetically pleasing. 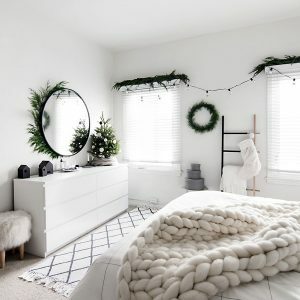 I have to learn how to make those mini wreaths– they’re just too cute!